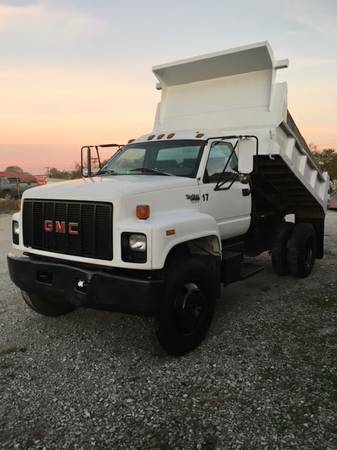 Selling my 1996 GMC TopKick Dump truck. Only 56,898 miles, 6.0 fuel injected V-8 GAS engine and 5&2 Manual transmission. Cranks, Runs, Dumps as it should. Very Good Tires (see pics). Tires are 10.00 R22.5. Very Good glass, no chips, no cracks. Good body and transmission. Runs Good. Hate to sell but I’m moving. New Battery. This is a GAS engine, NOT DIESEL. Again, Gas engine, not diesel. Manual Transmission, NOT Automatic. 25.9k GVWR, hydraulic brakes (not air brakes), so does NOT require CDL. If you need more info or additional pics call or text Bill at (256) 4 one 2 - 67 one 3.